I was really excited when this month’s challenge was announced. Scones are the perfect companion to the afternoon tea, a wonderful idea for a special breakfast and a great quick option when you have guests coming over on short notice. They are quick and easy, versatile and a great recipe to enjoy making with the kids. Audax did a great amount of work and research and provided us with an amazingly informative challenge. Please take the time to visit his blog and read his post. I promise you, you will learn so much and will never look at scones the same way again. To master making scones you need to know a little about the main ingredients: flour, liquid, chemical raising agents and fat. Flour: I used finely milled OO flour, all purpose flour and pastry flour and I have to say that the OO flour gave the tallest and lightest scones but not by far. Audax suggested triple sifting the flour and I guess that helped reduce the difference between the types of flour. Fat: You can use butter or shortening. I went for butter for flavor. Liquid: milk, buttermilk, soured milk, half-and-half, cream. I even used half orange juice and half milk in one batch to infuse it with orange flavor. Chemical raising agents always use fresh raising agents, baking powder deteriorates within two months once the jar is opened, the recommended dose is about 2 teaspoons per cup of flour. Baking powder nowadays is double action – there is an initial release of gas once the dry and wet ingredients are combined and there is another release of gas from the high heat of the oven. If you are using acidic ingredients (such as buttermilk, soured milk, cream, honey, cheese, tomato sauce etc) then use an additional ¼ teaspoon of baking soda per cup of liquid to help neutralise the acid and make the final baked product raise correctly. Baking soda is four times stronger in raising power than baking powder. You can make you own single action baking powder by triple sifting together one part baking soda and two parts cream of tartar store in an airtight container. Rubbing in the fat this is the part that allows you to control how flaky or tender your scones will come out. If you rub the fat in to the point it resembles fine bread crumbs the resulting scone will be soft and tender. On the other hand if you rub the fat in leaving some large particles (the size of peas) the resulting scone will be flaky. I tried grating the butter and then freezing it vs cutting it into cubes and I found that the grated frozen butter gave the best results. The final scones were laminated and crisp on the outside. 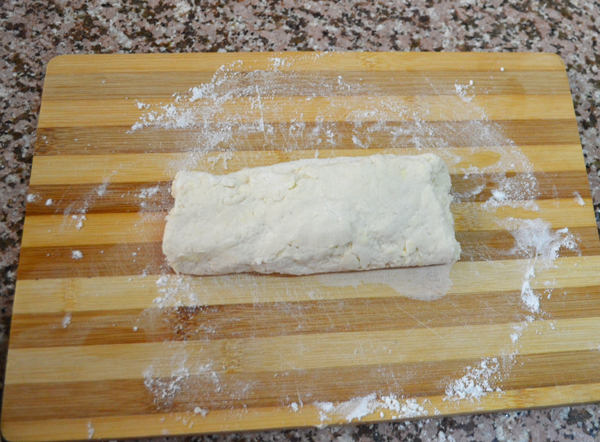 Moistening and bringing the dough together – add nearly all of the liquid at once to the rubbed-in dry ingredients. When mixing the dough (I used my finger tips but feel free to use a spatula), mix just until the dough is well-moistened and begins to just come together it will be wet (and sticky). And remember the old saying – the wetter the dough the lighter the scones (biscuits)! 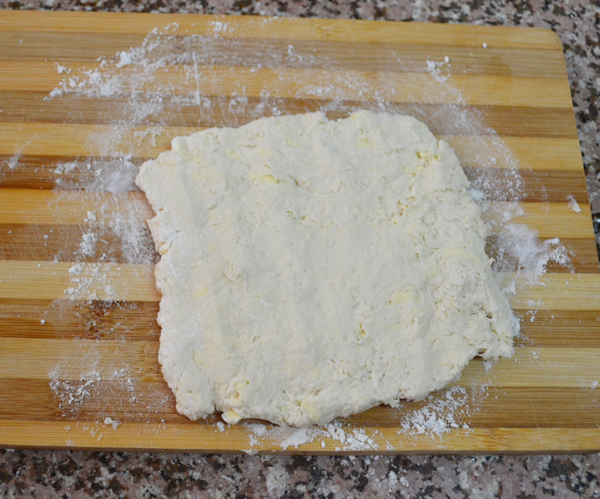 Then turn the dough onto a lightly floured board. Add the cheese, rosemary and spices to the dry ingredients after sifting and continue with recipe. This was the only time I didn’t use the challenge recipe, this recipe comes from Baked Explorations cookbook and I have to say I liked the challenge recipe better. This scone was more cake like in consistency rather than flaky and crisp. 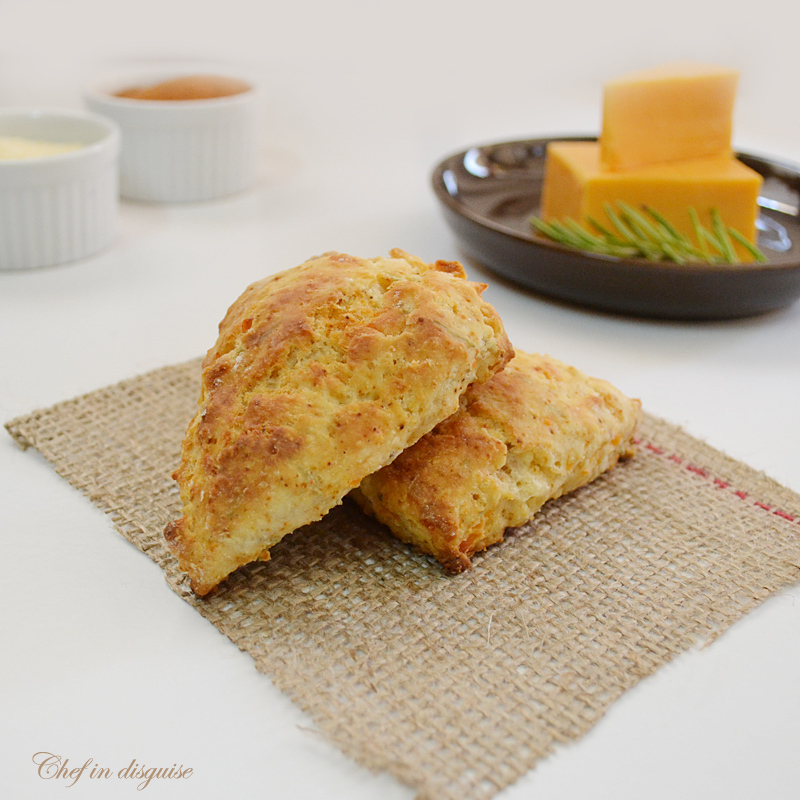 I think next time I will try to make them with the basic scone recipe. Preheat the oven to 375 degrees F. Line baking sheet with parchment paper. Place flour, sugar, cocoa powder, baking powder, and salt in the bowl of a food processor fitted with a metal blade. Process with six 1-second pulses. Remove cover of food processor and sprinkle the butter evenly over the dry ingredients. Cover and process with 12 1-second pulses. Transfer contents to a large bowl. In a medium bowl, whisk together the egg and cream. 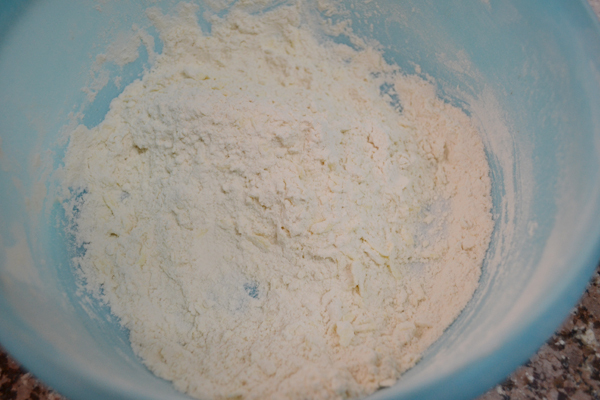 Stir into the flour mixture just until moistened. Add the toasted hazelnuts and knead gently to incorporate. 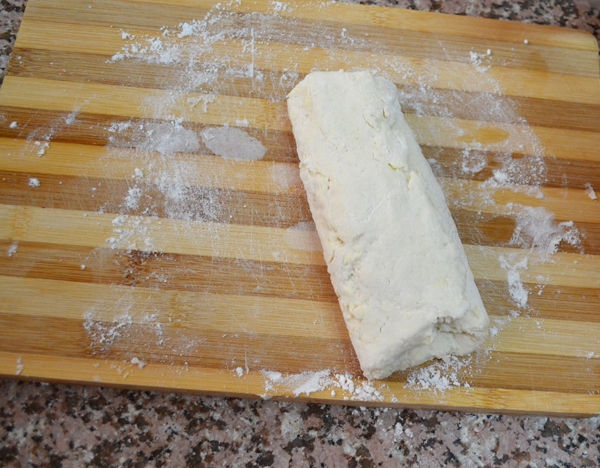 Knead the dough by hand 6 to 8 times (do not overprocess or scones will be tough). Flatten the dough into a rectangle approximately 6 by 12 inches and spread 1/4 cup of the Nutella on top in a criss-cross pattern. Roll the dough up to make a cylinder about 6 inches long, turn it on its end, and gently flatten it into a disk about 1 3/4 inches high. Do not overwork the dough. Cut the dough into 6 or 8 wedges and place them on the prepared baking sheet. Bake the scones for 18-20 minutes, rotating the baking sheet halfway through, or until a toothpick inserted into the center of a scone comes out clean. Transfer the scones to a wire rack to cool completely. Place the baking sheet with the parchment still on it underneath the rack. Posted in Bread and pastry, Breakfast, Chocolate, Daring bakers and tagged basic scone recipe, cheddar scones, feta olive scones, jam topped scones, nutella scones, pastry flour, savory scones, scones, scones tutorial, step by step, step by step scones recipe, sun dried tomatoes, types of flour. Bookmark the permalink. Wow, I came here expecting a recipe for scones, but I get not only about five recipes, but also a detailed analysis of what makes the best scones and why. Thanks Sawsan – I’m impressed, and as a Brit (come on, our afternoon snack of choice is cucumber sandwiches and scones with jam) I can honestly say I’m thankful for knowing so much about how to make better scones! Well Sawsan, I guess you did a job as complete as Audax’s! I love everything about your post, from photos to flavors… absolutely gorgeous! These are definitely some of the fluffiest and lightest scones I have ever seen! I’m no sure which one I’m going to try first because they all sounds and look delicious! Great post! Making me hungry for scones! Sawson, this is a fabulous post! One I will print and keep for your great tips! Trips sift!! wow… I can wait to make scones/biscuits again and follow along with this! Wow, you did outstanding work on this month’s challenge! I can’t decide which variation I’d want to try first… I’m thinking the cheddar rosemary garlic, but who can resist chocolate?? Really amazing job! How timely! I’m planning on baking buttermilk scones tomorrow with curd for a tea party on Sunday. I appreciate the tips! These are probably some of the fluffiest AND flakiest scones I’ve ever seen. They’re just stunning. Thank you for the tips – it’s a great help! I think you went a little scone-crazy there, Sawsan, but in the best way possible! Wow – I love the variety of them all. And thanks for all the great information. I’m speechless so many batches but the feta/olive/SD tomatoes is outstanding, wonderful that you enjoyed the challenge so much. I love your photos as well so professional worthy of a cookbook. Cheers from Audax in Sydney Australia. All thanks go to you Audax,for this challenge, the amount of research and effort you put into it.You are always an inspiration. wow, I love your photos, really make me hungry! :)) nice work! I’m drinking tea right now, and eaitng a piece of biscotti with it…. but I could tooootally go for a scone too. Especially a chocolate chip one! Can you believe I’ve never made a scone before? I hear it’s really easy and i’ve been meaning to, but it keeps getting pushed to the bottom of the list. I love all the variations you did!!! And thank you so much for the step by step pictures of the folding technique, I def. think I want to try that next time. When I first moved to Australia from the states I called a scone a biscuit. I’ll never do that again. 🙂 They look a lot like biscuits. I wouldn’t take a scone and put a piece of bacon and an egg in it though. hehehe it was really confusing when the challenge was first announced. Fantastic, Wonderful job! Your biscuits look amazing! Great picture tutorial, too! Your pictures are gorgeous, and the scones look amazing! Nice work. I love scones and I love all the variations you did. Particularly like the idea of making a log and cutting slices rather than rolling it out…brilliant! Thank you so much Korena. I look forward to trying your recipe for chocolate scones, they look super tempting. Love scones but never make them b/c all the recipes I have seen have so much butter & cream. Love how this recipe isn’t like that…all of your scones look scrumptious! Wow, those are truly fluffy scones, simply beautiful Sawsan! 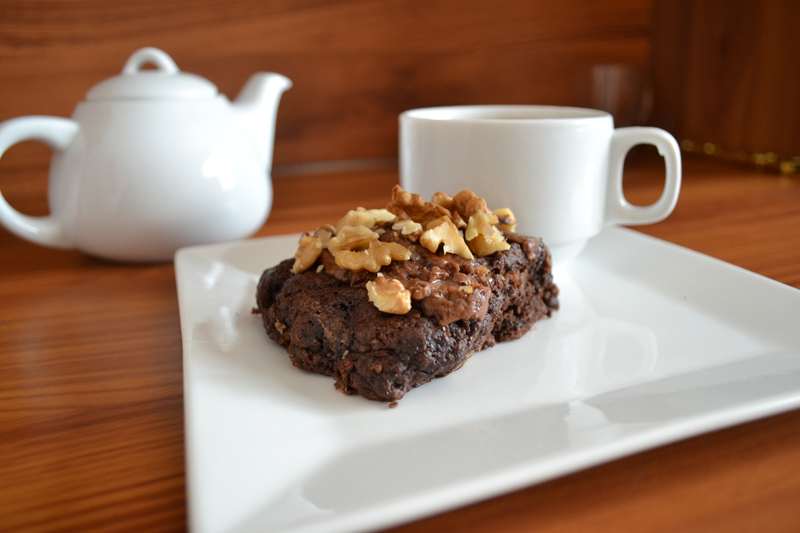 Personally, I love the savory ones, but I would not turn down a try of your gorgeous nutella scone (even though it didn’t receive the high marks of the variations of the basic scone recipe. Very impressive, non-the-less. Thanks for the link to Aud’s site, very comprehensive post; I shall bookmark for my next scone experiment and take his suggestions to heart. 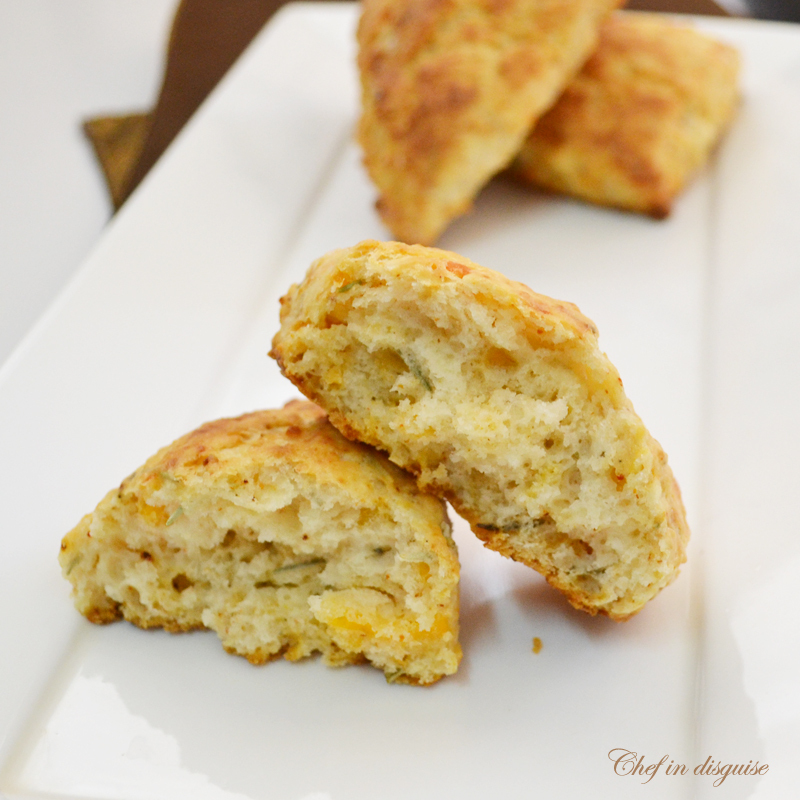 And I thought my scones were fluffy…these examples (including your’s) put mine to shame! You’ve inspired me to try again! I actually love savory ones too but I have to admit, a fresh out of the oven scone with butter and jam is hard to resist :). Audax is one of the most talented members in the daring kitchen and his blog is a wealth of information. 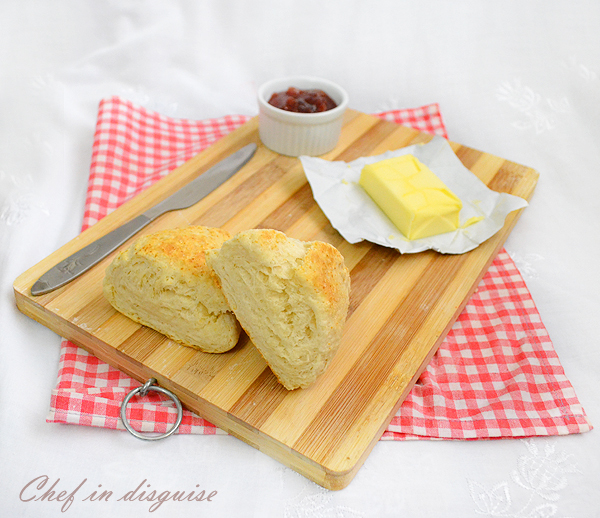 I made your basic scone recipe, Sawsan with a couple of minor modifications. I will mirror many comments above when I say I am very impressed with the little fat involved in this recipe (of course, the cheese blows that out of the water!). I made one batch (see my blog tomorrow) and my only regret is that I didn’t double, or even triple the recipe. They turned out AMAZING. Not nearly as fluffy as yours but then I didn’t test my baking powder (too lazy! and too late to go out and get more!). Thanks again for another winner recipe, this one is definitely going into my repertoire. I am really happy you liked the recipe Eva. The part I liked most about it is that it has so little fat yet it gives fluffy scones and you can adapt the recipe to sweet or savory. I wish mine came out as high as yours did – love all the variations – you really took on this challenge. Wow, that is quite the variety you were able to achieve this month! They all look delicious. Nice job on the challenge! OMG, your scones look amazing, and what a variety! I love the cheddar rosemary garlic and the nutella so much! Gorgeous photos too! The cross section is amazing! Another fantastic challenge by you! What a thoroughly informative post! Have never tried the 00 flour in scones before, but will now, and had never though of grating frozen butter before – and that strikes me as a pretty brilliant idea. Love the variations on a theme too. Thank you so much for this richly detailed and generous post! Wow, what a variety, and all are humble and delicious, can’t choose which one I liked most, because every one have it’s own taste, so I like all of them, yummy…. All the scones you made look delicious especially the feta and sundried tomato scones, excellent job! What an amazing job you have done on all these delicious scones. The tutorial was very helpful and the photos are so stunning! Wow! Where to start! This was incredibly informative and helpful Sawsan. I had no idea, for instance, that baking powder goes bad after it’s been opened for two months. Guess what’s on my grocery list now. 😉 And these scones look like perfection. I can just taste them. 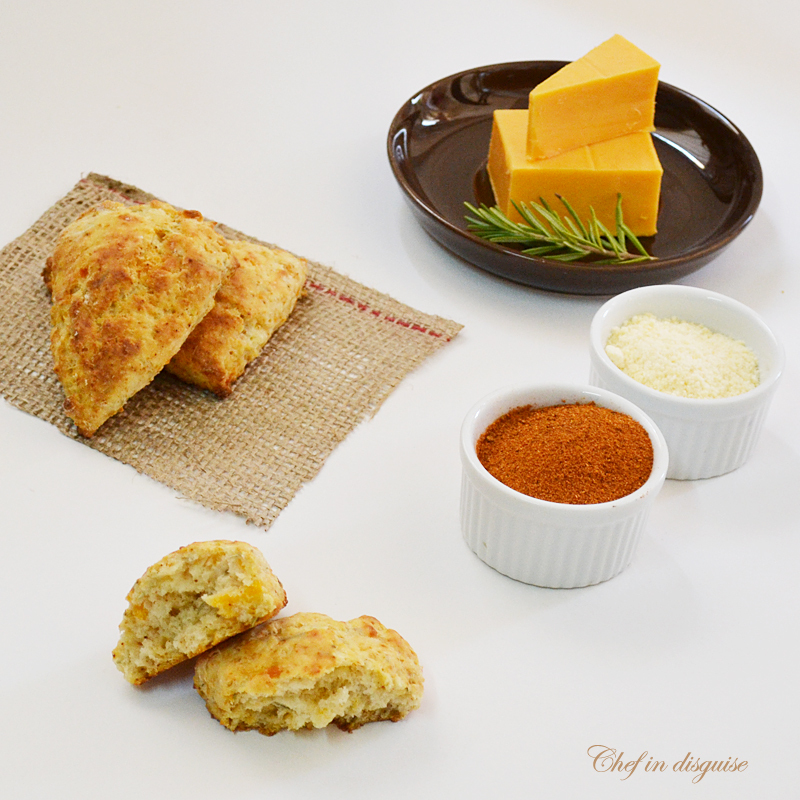 The cheddar rosemary scones would probably be my favorite. 🙂 And I love the picture of the scone with the tea and book. That just screams relaxation to me. I haven’t read a good novel in ages. Thank you so much Kristy, I did learn a lot this month and loved sharing it with everyone. I miss reading novels too. A very dear friend of mine gave me a few of her novels and I have not touched them yet, I can’t find the time! Fantastic towering scones! I usually like mine quite plain (I’m so boring), but your Nutella scones look outrageously good. I’ll have to try them out. I bet they’re gorgeous with a cup of tea on the side. I find I really like the results when I use a mixture of heavy cream and sour cream for the moist ingredients. It gives them a nice little tang and a really rich and soft feel to them. Glad you had such success with your challenge! i never made scones..neither did my sister. you have guts for taking up the challenge. props. the photos look great as usual! Hopefully my scones will never be the same, you have giving me a lot of information and what beautiful pictures! I want to do several different mixes here and will let you know how they come out! Doing better, still one armed and will be for a while longer! Having fun catching up here! Take care! Seriously, look at the variety! Amazing! These look like classic, light, flaky, tender scones. Perfection! Awe-inspiring! The variants sound lovely, but I must say there are times when a classic *plain* scone is anything but plain (okay, maybe with a lavishing of butter or cream, even better!) and utterly irresistible. The Nutella beauties look like delicious brownies to me–not like scones at all in my brain’s estimation of what is scone-like, but mighty tasty as brownies, all the same! I am with you on the plain scone,if I want to really enjoy a scone on its own I will make a plain one.You are right about the nutella scones too, they are not really scone like in texture but still they are really tasty and a welcome twist. Such a helpful post. I’ve made scones for years, but a bit carelessly. Your basic ones are so beautiful that I must try following instructions for a change. Sigh. Triple sifting is not my favorite. Love your post. I am a huge Downton Abbey fan and a foodie to boot, so the two have combined to my own blog on the food of Downton Abbey. http://downtonabbeycooks.wordpress.com. My motto is “simple food in a grand setting.”, so encouraging less experienced cooks to take the plunge into healthier eating to try some less intimidating recipes. I have started Tea Tuesdays, a weekly post dedicated to the English tradition of taking tea, and particularly building the Afternoon tea tray. 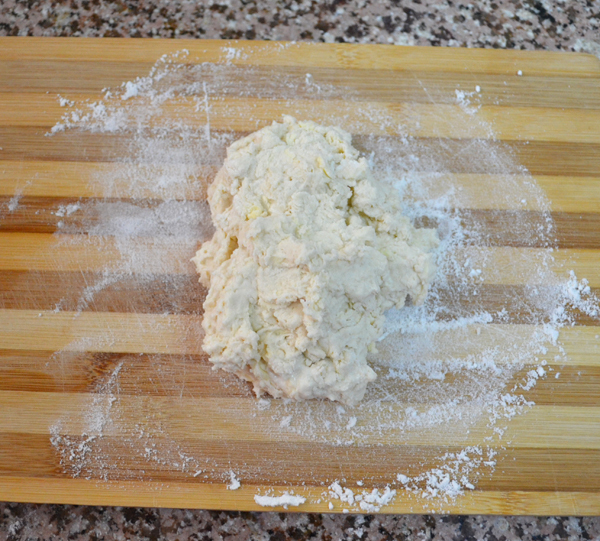 This week I posted a non-fat scone recipe and Eva at Kitcheninspirations put me on to this post, which not only provided a lower fat recipe, but tips on making great flakey scones. I will be sure to share with my readers, likely this week on Feedback Friday. Thanks again, and keep on keeping on! I am supposed to bring something to a Downton Abbey tea but I have to make it the day before. I’d like to try the scones but I wonder if they will taste okay the second day? hi ,sister sawsan! i’m so thankful happened to found your blog/website, i was looking for answers and tips to improve my scones which did not raise much, even hard as stone before..haha actually i felt a little bit discouraged at my unsuccessful attempts 😦 but your tips seems very truthful and informative and detailed.. 🙂 i haven’t found anyone else, even famous well-known tv chefs mentioned tips like you did! Thanks a lot! hope God bless you even more for this! Hi sawsan, wonder if you could kindly give some advise, i have one ‘problem’ in handling/cutting the scones, the dough was toooo sticky, could hardly knead it, even after i use some flour and it sticks to my fingers. is it because of too much liquid in the dough? How to overcome/avoid this? Thanks. if the dough is too sticky try adding less liquid next time. Different flours absorb liquid differently and the type you are using may not absorb liquid well. The recipe provided here will be sticky and will stick to your fingers, flour the surface you are working on and sprinkle flour on top of the dough and that should help you with handling it. Thank You for all the work you put into this post!!! VERY informative!